Impressively directed, superbly acted thriller, but it moves too slowly to really engage the audience and ultimately works better as a character study. George Clooney stars as Michael Clayton, an in-house fixer for a high-powered law firm, who specialises in cleaning up the jobs that no-one else can handle. When he gets a call from a panicked colleague (Tom Wilkinson as Arthur), Michael attributes his mental state to the stresses of his case, but when Arthur later turns up dead in mysterious circumstances, he suspects foul play and begins to dig deeper. Michael discovers that Arthur had been working against the interests of chemical company U/North, one of the company's biggest clients, in a case that could potentially cost them millions of dollars. Meanwhile, U/North's own hotshot lawyer, Karen Crowder (Tilda Swinton) struggles with her own role in the case. 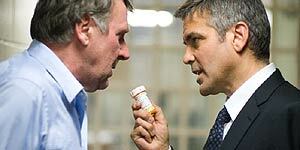 Clooney is superb as Michael, giving a multi-layered performance that suggests genuine depth as he finally comes to terms with exactly what his job involves. Swinton's emotionally cold persona is used to good effect here and there's also good work from both Wilkinson (extremely effective, despite only appearing in a handful of scenes) and Sydney Pollack, who's brilliantly cast as Michael's boss. The script is excellent, allowing the audience to process what we know about Michael for ourselves (for example, his divorce and his gambling addiction as symptoms of his moral decay) rather than spelling it out in mile-high letters. The main problem with the film is that it moves too slowly to really succeed as a thriller, despite director Tony Gilroy's attempts to liven things up a bit by shoe-horning in an early explosion and then treating the rest of the film like a flashback leading to that moment. Despite a multi-layered script and some outstanding individual scenes, Michael Clayton never really engages as a thriller, though it's still worth seeing for Clooney's performance.